Today, Congressman Tim Walz lauded the enactment of legislation that includes a landmark expansion of the GI Bill of Rights for our nation's veterans. President Bush signed the bill into law today. "Today, we make clear, not just in words but in deeds our commitment to the brave veterans who have served our nation by giving them the chance to attend college and succeed when they return home," said Walz. "This is a significant expansion of educational benefits for our veterans -the 21st Century GI Bill restores educational benefits used by pervious generations of veterans and is designed to keep pace with the real-world costs of a higher education." Josh Howe, Southeastern Regional Coordinator for Higher Education Programs at the Minnesota Department of Veterans Affairs said, "I'd like to thank Congressman Walz, the President and others for the bi-partisan support that made this bill a reality. But most of all, to the veterans and servicemembers of past wars and the current operations in Afghanistan and Iraq, I say thank you for your service. Our future and that of our families is a little brighter on this historic day." More than 20,000 service members from Minnesota have been deployed to Iraq or Afghanistan. Unfortunately, current benefits pay only about 70 percent of a public college education and 30 percent of a private college education for these veterans when they return home. The expanded GI Bill will restore full, four-year college scholarships for veterans of the Iraq and Afghanistan wars to help make them part of an economic recovery like the veterans of World War II. The legislation will also allow veterans to transfer those benefits to family members. "When President Roosevelt signed the original GI Bill in 1944, he observed that it 'gives emphatic notice to the men and women in our Armed Forces that the American people do not intend to let them down," said Walz. "Today we are renewing our commitment to stand with the members of our Armed Forces when they return home." Veterans struggling with GI Bill benefits or other benefits earned as a result of their service should contact Congressman Walz's Rochester office at 507-206-0643 for assistance. We've had a busy day, but will post a look at some of the delightful reading in today's district newspapers sometime tonight. While you wait, go over to the Walz campaign site and contribute; today is the last day of the Q2 fundraising quarter. It's important to keep Walz working for veterans in the district! And if you have any more spare change, help elect more good Democrats by giving to the Red2Blue MN Act Blue campaign. It has achieved its modest goal--and every little bit helps. Sponsored link: Use the new GI Bill to get a masters in education. 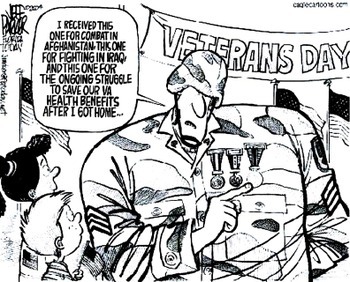 Cartoon: The new legislation deals mostly with education benefits, but the cartoon reflects what a number of returning vets have told us about the struggle to maintain adequate health care.